The Battle of the Falaise Pocket was fought August 12-21, 1944, during World War II (1939-1944).Landing in Normandy on June 6, 1944, Allied troops fought their way ashore and spent the next several weeks working to consolidate their position and expand the beachhead. This saw the forces of Lieutenant General Omar Bradley's First US Army push west and secure the Cotentin Peninsula and Cherbourg while the British Second and First Canadian Armies engaged in a protracted battle for the city of Caen. It was Field Marshal Bernard Montgomery's, the overall Allied ground commander, hope to draw the bulk of German strength to the eastern end of the beachhead to aid in facilitating a breakout by Bradley. 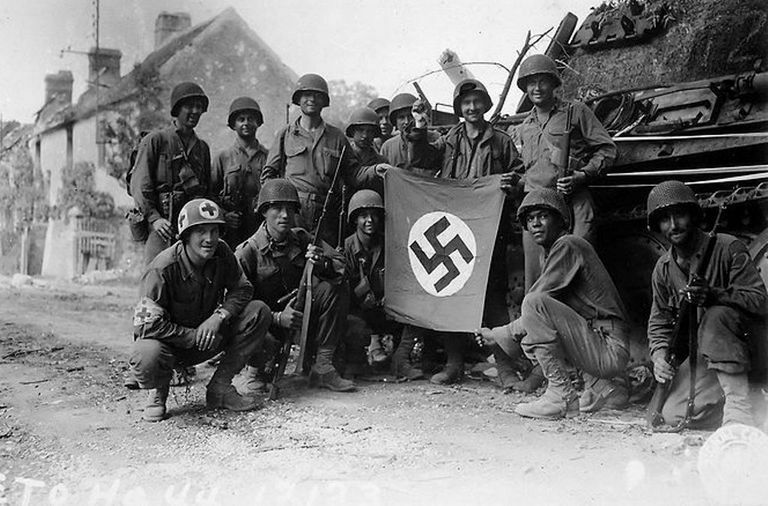 On July 25, American forces launched Operation Cobra which shattered the German lines at St. Lo. Driving south and west, Bradley made rapid gains against increasingly light resistance (Map). On August 1, the Third US Army, led by Lieutenant General George Patton, was activated while Bradley ascended to lead the newly-created 12th Army Group. Exploiting the breakthrough, Patton's men swept through Brittany before turning back east. Tasked with rescuing the situation, the commander of Army Group B, Field Marshal Gunther von Kluge received orders from Adolf Hitler instructing him to mount a counterattack between Mortain and Avranches with the goal of reclaiming the western shore of the Cotentin Peninsula. Though von Kluge's commanders warned that their battered formations were incapable of offensive action,Operation Lüttich commenced on August 7 with four divisions attacking near Mortain. Warned by Ultra radio intercepts, Allied forces effectively defeated the German thrust within a day. With the Germans failing in the west, the Canadians launched Operation Totalize on August 7/8 which saw them drive south from Caen towards the hills above Falaise. This action increasingly led to von Kluge's men being in a salient with the Canadians to the north, British Second Army to the northwest, First US Army to the west, and Patton to the south. Seeing an opportunity, discussions ensued between the Supreme Allied Commander, General Dwight D. Eisenhower, Montgomery, Bradley, and Patton regarding enveloping the Germans. While Montgomery and Patton favored a long envelopment by advancing east, Eisenhower and Bradley supported a shorter plan designed to surround the enemy at Argentan. Assessing the situation, Eisenhower directed that Allied troops pursue the second option. Driving towards Argentan, Patton's men captured Alençon on August 12 and disrupted plans for a German counterattack. Pressing on, the lead elements of Third Army reached positions overlooking Argentan the next day but were ordered to withdraw slightly by Bradley who directed them to concentrate for an offensive in a different direction. Though he protested, Patton complied with the order. To the north, the Canadians launched Operation Tractable on August 14 which saw them and the 1st Polish Armored Division slowly advance southeast towards Falaise and Trun. While the former was captured, a breakthrough to the latter was prevented by intense German resistance. On August 16, von Kluge refused another order from Hitler calling for a counterattack and secured permission to withdraw from the closing trap. The next day, Hitler elected to sack von Kluge and replaced him with Field Marshal Walter Model (Map). Assessing the deteriorating situation, Model ordered the 7th Army and 5th Panzer Army to retreat from the pocket around Falaise while using the remnants of the II SS Panzer Corps and XLVII Panzer Corps to keep the escape route open. On August 18, the Canadians captured Trun while the 1st Polish Armored made a wide sweep southeast to unite with the US 90th Infantry Division (Third Army) and French 2nd Armored Division at Chambois. Though a tenuous linkup was made on the evening of the 19th, the afternoon had seen a German attack from inside the pocket breakthrough the Canadians at St. Lambert and briefly open an escape route east. This was closed at nightfall and elements of the 1st Polish Armored established themselves on Hill 262 (Mount Ormel Ridge) (Map). On August 20, Model ordered large-scale attacks against the Polish position. Striking through the morning, they succeeded in opening a corridor but could not dislodge the Poles from the Hill 262. Though the Poles directed artillery fire on the corridor, around 10,000 Germans escaped. Subsequent German assaults on the hill failed. The next day saw Model continue to hit at Hill 262 but without success. Later on the 21st, the Poles were reinforced by the Canadian Grenadier Guards. Additional Allied forces arrived and that evening saw the gap closed and the Falaise Pocket sealed. Casualty numbers for the Battle of Falaise Pocket are not known with certainty. Most estimate German losses as 10,000–15,000 killed, 40,000–50,000 taken prisoner, and 20,000–50,000 escaped east. Those that succeeded in escaping generally did so without the bulk of their heavy equipment. Re-armed and re-organized, these troops later faced the Allied advances in the Netherlands and Germany. Though a stunning victory for the Allies, debate quickly ensued regarding whether a greater number of Germans should have been trapped. American commanders later blamed Montgomery for failing to move with greater speed to close the gap while Patton insisted that had he been allowed to continue his advance he would have been able to seal the pocket himself. Bradley later commented that had Patton been permitted to continue, he would not have had sufficient forces in place to block a German breakout attempt. Following the battle, Allied forces quickly advanced across France and liberated Paris on August 25. Five days later, the last German troops were pushed back across the Seine. Arriving on September 1, Eisenhower took direct control of the Allied effort in northwest Europe. Shortly thereafter, Montgomery and Bradley's commands were augmented by forces arriving from the Operation Dragoon landings in southern France. Operating on the unified front, Eisenhower moved forward with the final campaigns to defeat Germany.